Microsoft’s new Search Decision Engine called Bing is live now (in preview/beta). I thought Bing meant “Bing Is Not Google” but apparently “bing!” is the “sound of found.” Found it! Bing! Click the Wrench Icon in Google Chrome and click Options. Click “Manage” under Default Search. Now with your new Bing entry selected, click Make Default. Go give Bing! a try. 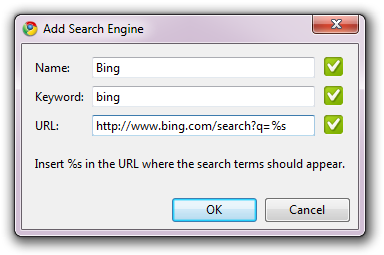 I’m going to use Bing for the whole month of June and see how it goes. I’ll blog my results. Technical International Note: If you’re outside the US, while Bing is rolling out over the next few days (it’s literally rolling) you can temporarily force it to think you’re in the US with this Bing URL. Feel free to post your Bing tips and impressions here in the comments, or follow @bing on Twitter. The Search companion in Windows XP searches for hidden and system files differently than in earlier versions of Windows. This guide describes how to search for hidden or system files in Windows XP. HKEY_CURRENT_USER Software Microsoft Windows CurrentVersion Explorer CabinetState. You may need to create a new string value labeled “Use Search Asst” and set it to “no”. 3. Fill in “bikes, flowers, cars” or any other word. 4. You will get a page with alot of images thumbnailed. 6. Copy the script down here, and paste it in your adressbar !